ISLE OF MAN – Microgaming introduces Action Ops: Snow & Sable, the latest sci-fi themed online slot developed by Triple Edge Studios, exclusively for Microgaming operators. Set in the futuristic city of Aurora, Action Ops: Snow & Sable provides players with the opportunity to jump into the action with the crime-fighting duo and harness the powers of the elite cyber agents to reveal Mixed Wild Pays, Stacked Wilds and Free Spins. The two characters are prominently featured as Wilds and drive most of the action, by providing both individual and mixed pays. Scatter symbols provide access to a high-paying 10, 15 or 20 free spins round by getting three, four or five scatter symbols respectively. Once in free spins, Snow & Sable are even more prevalent as they make reels one and five fully wild on every spin. The game will randomly assign a character to reel one and five on each spin, with the player aiming to get the same character on each reel for heightened win potential. This greatly increases the potential for prizes, driving focus on the three centre reels to get high-paying 5-of-a-kind combinations. When a player lands on two or three scatters during free spins, they will receive five or ten additional spins. 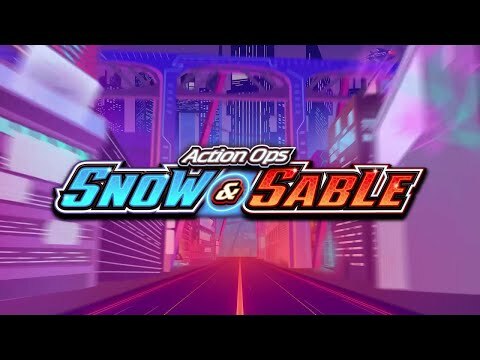 Players can join Snow & Sable for a wild action-filled ride as the game is now live exclusively for Microgaming operators. Action Ops: Snow & Sable is another creation by Triple Edge Studios – hot on the heels of their previous title, Wicked Tales: Dark Red. Featuring Mixed Wild Pays, Stacked Wilds and Free Spins, players can jump into futuristic, sci-fi slot action with the daring duo. This high volatility game offers wins up to 1,000 times the initial bet with a potentially rewarding base game, complemented by a free spin experience that has a high theoretical average return and the ability to retrigger. We look forward to unveiling more action-packed content from Triple Edge Studios in the coming weeks.